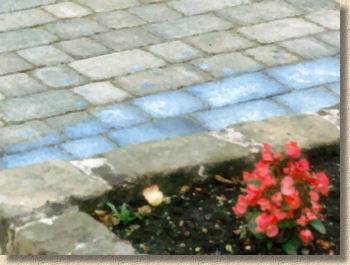 As more and more paving is jointed with dry sand and other loose materials, it has become apparent that heavy surface water flow (aka 'scour'), high-powered street sweepers and vacuums, weathering by wind and rain, and even occasional power washing can loosen and dislodge the jointing sand, leaving the joints empty and thereby compromising the integrity of the pavement. Several manufacturers have produced "Stabilising Compounds" that can be applied to dry sand joints on completion of the paving works, or later. These compounds are typically a liquid that is applied over the surface of the paving from where it penetrates the jointing sand and begins to set or cure, binding together the individual grains of sand, and, in some cases, binding the sands to the edges of the paving. Any excess liquid left on the surface of the paving is rapidly worn off and the character of the work is unaffected. Each stabilising compound has its own much-vaunted "unique formulation" - some are water based and set by evaporation while others feature a polymer resin and rely on curing by contact with air or residual moisture within the paving/bedding/jointing. While some are sold simply as joint stabilising liquids, others boast additional benefits, such as inhibiting weeds or waterproofing a surface.